Would you make a good magician? Take our career test to find out how you match with this and over 800 other careers. What is the workplace of a Magician like? A magician is someone who will entertain an audience by performing magic tricks, effects or illusions. These tricks and illusions seem impossible or supernatural to the audience. The magician learns these magic tricks by practicing them over and over again, sometimes taking hundreds of hours to perfect. Sleight of hand tricks especially require extensive practice to ensure that the trick is executed without flaw while performing. A magician can find work by performing at restaurants, birthday parties, special events and weddings, and if especially charismatic and skilled, can also work their way up to performing in larger venues, including major night clubs, Las Vegas venues, and even make television appearances. Audiences are in general very skeptical, and they watch intently so as to spot 'the trick'. A magician's techniques however, have been perfected over time by constant practice and performance in order to withstand even the highest scrutiny. A magician will use visual, sensory and auditory illusions in their tricks, since it is a well known fact that a person's perception can contradict what is physically happening. Cognitive illusions are also used; by manipulating people's memory, their logic, and by misdirecting their attention (such as releasing a dove). Are you suited to be a magician? 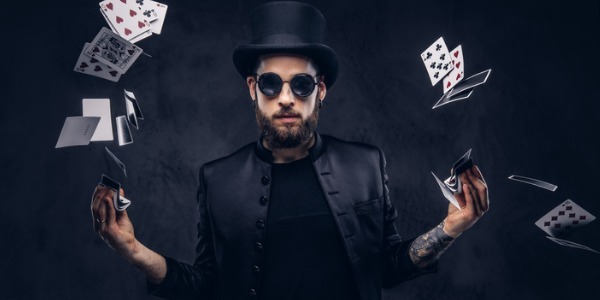 Magicians have distinct personalities. They tend to be artistic individuals, which means they’re creative, intuitive, sensitive, articulate, and expressive. They are unstructured, original, nonconforming, and innovative. Some of them are also enterprising, meaning they’re adventurous, ambitious, assertive, extroverted, energetic, enthusiastic, confident, and optimistic. Does this sound like you? Take our free career test to find out if becoming a magician is right for you. Work for magicians can be found at birthday parties, weddings, and themed restaurants. A magician who is especially charismatic and skilled may also work in larger venues including television specials and major night clubs.